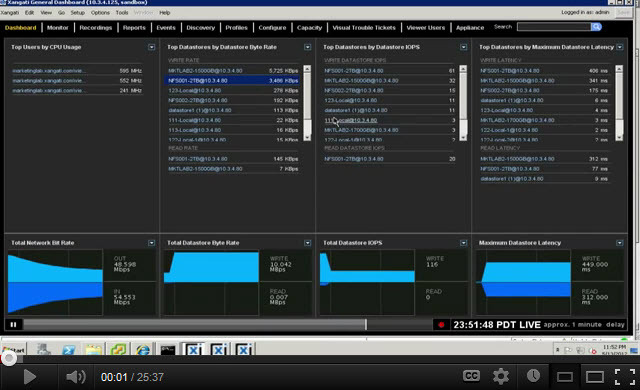 I’m a big fan of free tools and, being a network guy originally, I have always been impressed with Xangati’s management dashboard (XMD) – a vSphere performance management tool – because it has the ability to collect Netflow data from the virtual network and intergrate that with more traditional performance stats. Additionally, it deploys as a virtual appliance and it can scroll performance stats of the virtual infrastructure back in time, like a DVR (you have to see it). This week, Xangati released an all new & updated version of XMD, now at revision 9, and it offers a long list of new features. One of the most important features is that Xangati now offers massive scale, dubbed “cloud scale”, with the ability to analyze performance on some of the largest cloud infrastructures. Of course these new features have also been added into the free version. I could attempt to list out all the new features here but the best way to learn about them is to see them for yourself in this video by Xangati’s Nathaniel Iverson. I encourage you to try out the new XMD functionality for yourself in the Xangati VI Dashboard and VDI Dashboard trial software or in the Xangati for vSphere—Free single host tool.